Pictured is the New Haven 5th Grade Basketball Team. 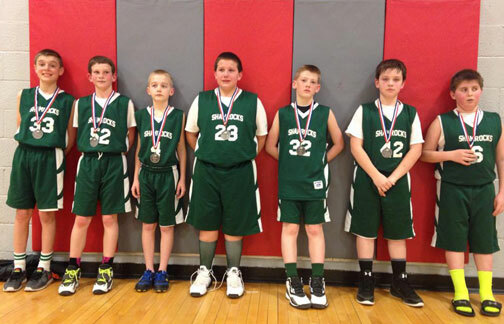 --Unfortunately the 5th grade Shamrocks experienced a bit of heartbreak Saturday in the finals of the St. Clair Junior Bulldogs tournament. We had played one of our best games of the year in the play-in round Friday night, beating Sullivan 36-22. On Saturday morning we took on a tough and physical Pacific team but survived, 27-25. We handled St James in the semifinal 30-20 which got us a championship date with Owensville. The 5th grade Dutchmen are pretty clearly the top team in the area. We had lost to them twice before: Once in the Hermann tournament where they pretty much ran us out of the gym, and again in the finals of the Owensville tournament where we had a chance to win until late in the game, when again their speed and size took us over. Still we thought we had a chance to beat them. Coach Tim Meyer and I had been talking about it. Maybe if we could limit their running game, control the boards and convert enough chances on the offensive end we could take them. Yes it would take some luck and probably a minor miracle, but hey you never know. At least we thought we could have a chance. So there we were, facing off again in the championship contest. The game format had changed because of the weather: An 18-minute running clock per half throughout the game, including the key last two minutes of the game. For us this meant the game would be shortened, which was a good thing. Particularly the running clock over the last two minutes would be in our favor. The less we had to see of Owensville's pressure defense, the better. One of the New Haven parents had asked me before the game what our game plan was. “Get lucky,” was pretty much my response. Limit Owensville's run and gun opportunities, make them play in the half-court, hope we can hit shots and hope that we can somehow stay close enough to have a chance at the end. The game started somewhat sluggishly on both sides. It was 4-4 with something like 10 minutes to play in the first half. But the longer we could keep the score down, the better. By halftime it was just 9-8 Owensville, and despite having not played that well I told our kids that we have them right where we want them. Which was kind of true. It was also true that we hadn't played that well. A few better passes and a few made layups and close-in looks would have given us a lead, so we came off the floor at halftime kind of down. But again I told the kids to lighten up, we were right there with them. Maybe the message got through, because we managed to get to the basket and get a lead early in the second half. A few open looks and a few made baskets and all of the sudden we were up 15-9. For the first time in our games with them I sensed some frustration on the Owensville side. We were getting close to pulling off the upset we thought we had in us. Still a lot of game to be played however. But we made some smart plays to get a couple easy baskets and soon we were on the verge of putting it away. Because of the shortened game we only got two timeouts for the game, and I took my first timeout with some 5 minutes to play to settle kids down. 21-14 us. Keep the ball moving, I said. Get to the basket. We need one more good look. Owensville really does have a great group of kids. Quick, athletic, well-skilled for this grade level. Withstanding their pressure was going to be tough. As expected their pressure took its toll and they got a couple baskets in transition that hurt. They were swarming the ball on defense and making it tough to run our offense. It was crunch time and we needed one more play, one more rebound, one more fortunate break to go our way. The running clock was definitely our friend. Despite the Owensville pressure we were holding on just enough. The clock was running on free throws which caused the Owensville coach to have to call timeouts twice down the final stretch of the game. When we corralled a rebound with 21 seconds left and still leading 21-18 it seemed like the game might be ours. Owensville had fouled on the rebound so one of our guys went to the line to shoot a 1-and-1. 21.8 seconds on the clock. Owensville had spent their last timeout so in the huddle we were trying to conjure up good vibes. Just like in practice, we were telling our shooter. Concentrate. We pulled the rest of the team back to guard Owensville in transition. Hawk the ball, but don't foul the shooter! Hand in their face at the 3-point line! Get the rebound! We were on the verge of what would be a classic grade-school upset. One made free throw away, one defensive stop in transition. Our kid put up his free throw but unfortunately it rimmed out, and Owensville came down the court in a frenzy. Their top outside shooter got the ball and made a bit of a move at the 3-point line. We had him covered though not exactly with a hand in his face. When his shot went up it looked clearly off, and I was already looking for our position on the rebound. Unfortunately the bank was open and sure enough the kid banked the 3-pointer home. 21-21 ballgame. Ugh. Part disbelief, part punch in the gut. Our kids had the presence of mind to get the ball down the floor and I was able to spend my last timeout to set up a last second chance. We tried to set up a high screen to release our point guard for a drive, but somehow the message didn't get through. The screen didn't get set and while we were able to get the ball inbounds Owensville knocked the ball loose and after a scramble time expired. Overtime. Owensville won the tip and scored, and we were up against it. We would not score again and the clock ran out and Owensville emerged the victors. Some of our guys had tears in their eyes. But there was nothing to be ashamed of, we had fought valiantly and sometimes the ball doesn't bounce your way. Both sides congratulated each other afterwards and win or lose, it was a great ballgame. I think both sides left there with a lot of respect for the other team. Despite having lost to them three times Owensville is a great opponent and I have nothing but respect for their players and coaches. The New Haven crew drove home in a snowstorm and no doubt there were some long faces on the ride home. As a coach I kept re-playing the final minutes in my mind. It is just 5th grade basketball of course but it doesn't make the competition any less compelling. We had fouls to give, maybe we should have fouled them? Should we have gone man defense to cover their 3-point shooters? Just one little ol made free throw. As I told the kids afterward, we were “this close!” to winning it. Basketball can be a funny game. I hope the kids learn something from their experience. Number one I hope they learn that if you believe in yourself and work hard that anything is possible. Number two is when you've given your all and walk off the court there are no losers. Yes we lost the game but we won the respect of the Owensville team and their fans, no doubt about that. Number three is how can we improve? Every one of our guys made mistakes in that game—and coaches too—and when you are this close then one more play, one more pass, one different decision by a coach might be the difference. How can we improve? The last minute literally kept me up that night, my mind racing. Should we have fouled, when we had fouls to give? Should I have had Player A set the screen instead of Player B? Probably we should have kept it simple on the inbounds play. Etc. etc. But again this is 5th grade ball we are talking about. My kid was disappointed but not exactly all tore up about it. Still I can't imagine what goes through a coaches mind who's playing for much higher stakes. I told the kids afterward there would be many battles to come. We'll be playing the Dutchmen and the Tigers and Bearcats for years. Can't wait to see how some of those future games unfold. Keep working hard and the next time maybe the ball will bounce our way. But no matter what, win or lose, we definitely we did New Haven proud that day. Yes I am definitely proud of my kids.